I ran into these at a local store while grocery shopping last week. The combination of the words “limited edition” and the price of 5 for $2 was far too tempting to resist. They were announced last June, and they also come in a Dark with Almond variety, but I haven’t found any of them yet. I figured the taste wouldn’t be that different from a regular Snickers. I’ve had dark chocolate many times, and while it’s not my favorite, I can eat it no problem. The Snickers Dark however is so chocolatey. It tastes like the entire bar is full of chocolate, instead of just being coated in it. It was actually pretty good, and I’m sure dark chooclate fans will be super excited that they’re being catered to, but the chocolate was overpowering to the other flavors in the bar. That’s how dark chocolate tends to taste, at least for me, that sort of bitter aftertaste sticking around and covering up the caramel, nuts and nougat. I still prefer the traditional Snickers, but dark chocolate fans will probably disagree. I haven’t tried this yet. Now I am intrigued. I am a big dark chocolate fan. I tried the dark chocolate version of Milky Way the other day, and It wasn’t bad, but the two things just don’t seem to go together well. ooo i would really like to try the dark chocolate with almonds! I love dark chocolate and I thought the dark chocolate snickers was quite good. It’s hard to forget what the regular snickers taste like and just enjoy the dark chocolate snickers for what it is, but I think if I had a few more of them I would end up liking them better. Tried a dark chocolate snickers the other day. AWESOME! I like regular snickers , but the dark chocolate is unbelieveable. Lets not leave these as limited. Crank these babies out of the factory and dont stop. I found them at a dollar store a few months ago. NOt seen since. WHere have you seen them??? I am slowly converting to dark chocolate, but I definitely like the dark Snickers better than regular. Seems like it’s gourmet without the high price tag. I absolutely adore the Dark Snickers, they are not as cloyingly sweet as the regular. I can find them at my local Short Stop gas station and at Walgreens. I used to adore regular snickers- still do, but the dark one is my favorite. Plus we can tell ourselves it is healthy- nuts and dark chocolate are good for us. Just tried one. 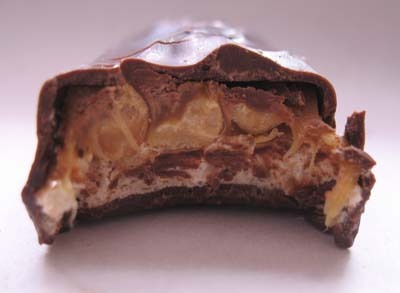 Really good – I like it better than the regular Snickers, which has a bit of a slimy feel to it. They don’t list the Nutritional info, fat numbers etc. on the label or the web site. OMG I’m a HUGE dark chocolate fan and my fav candy bar was always snickers although milk chocolate gags me most of the time. This bar was AWESOME….but hard to find. I agree with whoever it was that said KEEP CRANKING them out!